The city of Liverpool has numerous heritage-based claims to fame. It’s role in immigration, shipping, and transportation is well known. Of course, it is also home to the most famous band of all time, The Beatles. 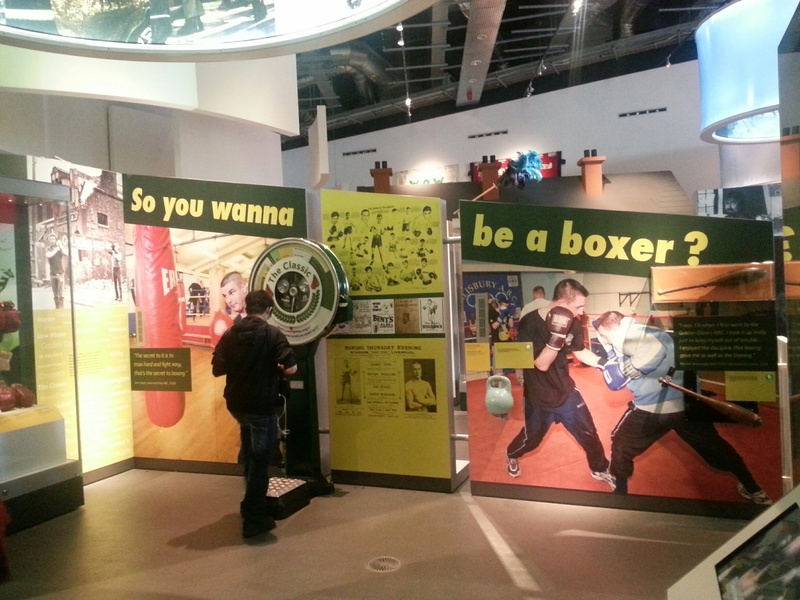 However, it is also a major centre for sport heritage – and, as a recent trip to Merseyside revealed – the city’s sporting past is well represented through museums, tours, and other heritage-based experiences. Of course, Liverpool’s sport heritage begins – most notably and publicly – with the city’s football teams. Liverpool FC is, far and away, the most broadly and widely represented – at least in the tourist areas in the city centre and at the Albert Dock. 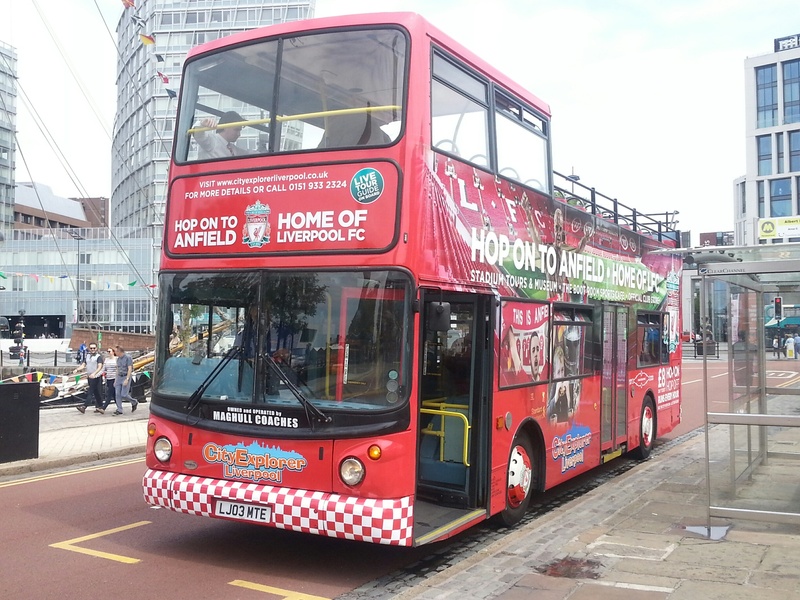 In fact, there is a dedicated hop on/off Liverpool FC tour bus that runs between the Albert Dock and the team’s home stadium, Anfield. The bus runs all day (with the team’s famous anthem, “You’ll Never Walk Alone”, blaring from the bus’ speakers). En route to Anfield, the guide provides a thirty minute commentary about the team’s background, as well as it’s historical connections and rivalry with Everton, before arriving at the gates of Anfield. In speaking with our guide, Paul, he mentioned that the tour bus has been running for a little over a year and has been immensely successful. Specifically, he noted that the bus was initally only going to run during the summer peak tourist season, but that demand pushed it to a year-round venture. It should be noted that my colleague and I were the only patrons on the bus during our tour, though Paul mentioned that this was quite unusual. He did say, however, that as Anfield was undergoing extensive renovations, the stadium tours were somewhat limited and they did notice a dip in visitors this summer. That said, Liverpool boasts over 500 million global supporters and, as such, there seems to be the potential for a steady supply of sport-based pilgrims. It is also fascinating – and, as far as I know, unique – to have a city tour and tour company dedicated to a specific sport club. Indeed, this appears to signal a growing demand – at least in certain places – for sport heritage experiences and particular forms of heritage sport tourism. 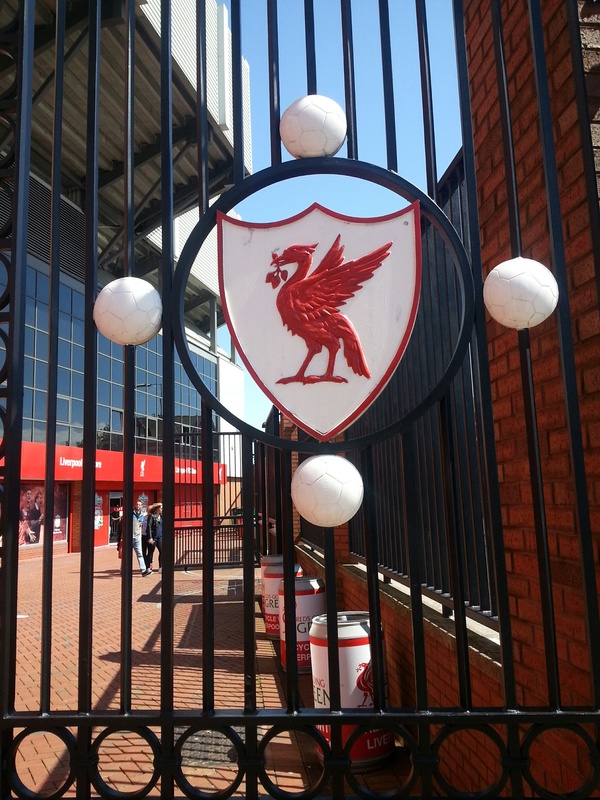 Places like Anfield appear to be able to welcome a variety of visitors who wish to “make a day” out of experiencing the club’s heritage and culture. Arriving at the stadium, tourists could take a standard stadium tour, a tour with an ex-player (demonstrating the links that both myself and Sean Gammon of the University of Central Lancashire have explored linking sport heritage to “living” artefacts like ex-athletes), as well as visit the team museum, take their picture next to several team statues and plaques, visit a large team shop, and dine at a team-themed restaurant (complete with team and player artefacts adorning the walls). Just across Stanley Park from Anfield resides Goodison Park, home of Everton FC. Although the two squads compete in the same league, and the stadiums reside steps from one another, they feel like a world away – at least in terms of touristic support. Everton feels like a local club, whereas Liverpool appears to have much larger global ambitions. Similarly, a tourist could spend much of a day at Anfield, whereas Goodison Park did not offer a stadium tour and had a small shop across the road . In fact, my colleague and I appeared to be the only people visiting the stadium. 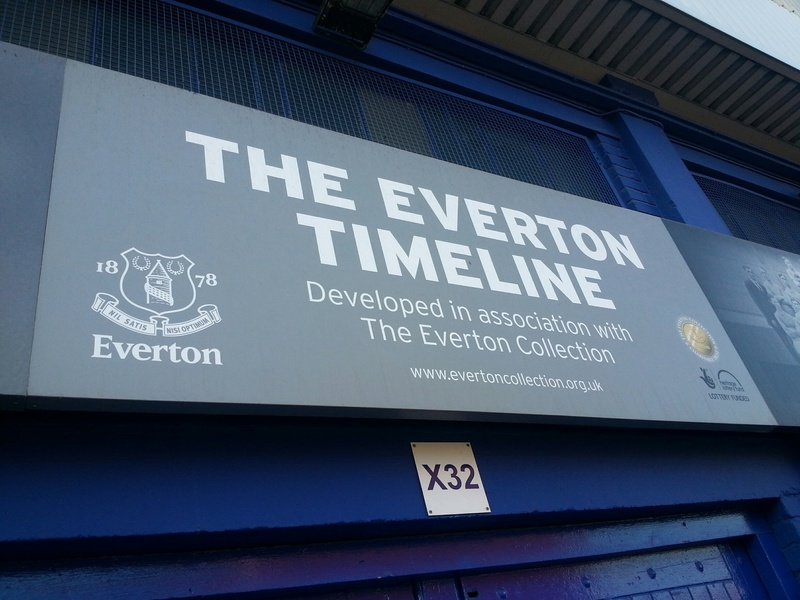 That said, there is still a very prominent representation of the club’s history and heritage around the stadium. For example, the entire circumference of the stadium is ringed with a club timeline, highlighting the club’s major victories, players, and accomplishments. 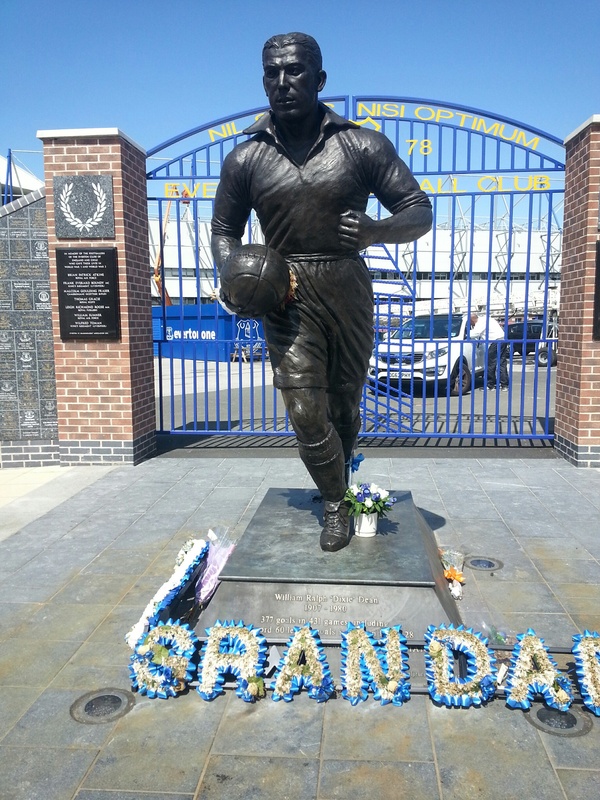 The main gates to Goodison Park also featured a statue of Everton’s greatest and most beloved player, Dixie Dean. While the heritage experience at Everton was much more muted, and less public, that at Liverpool, there was a strong appeal to it as well. In many respects, it was a heritage for the faithful; for people who already loved and supported the club, rather than as primarily a commodity for a large international fan base. As complicated as this word is, it felt more real and, in that I suppose, that give it a greater sense of authenticity. The importance of both Liverpool and Everton football clubs are also prominent in the Museum of Liverpool’s popular culture gallery. 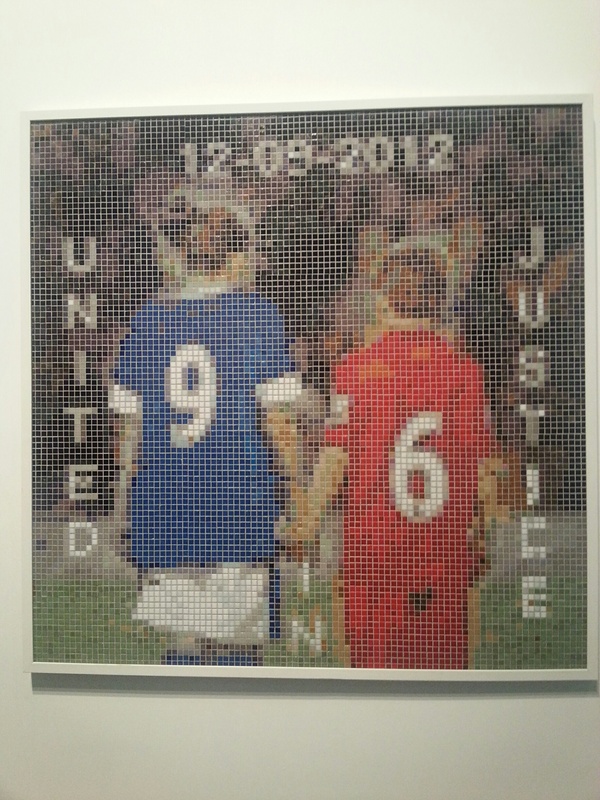 In particular, the events of the Hillsborough disaster, where 96 Liverpool supporters were killed at a match in Sheffield in 1989, are described and commemorated in the gallery, and specifically how the two local rival clubs came together in remembrance. Indeed, one of the surprising elements of the gallery are the variety of different sports played in Liverpool and how they have shaped different parts of the city. 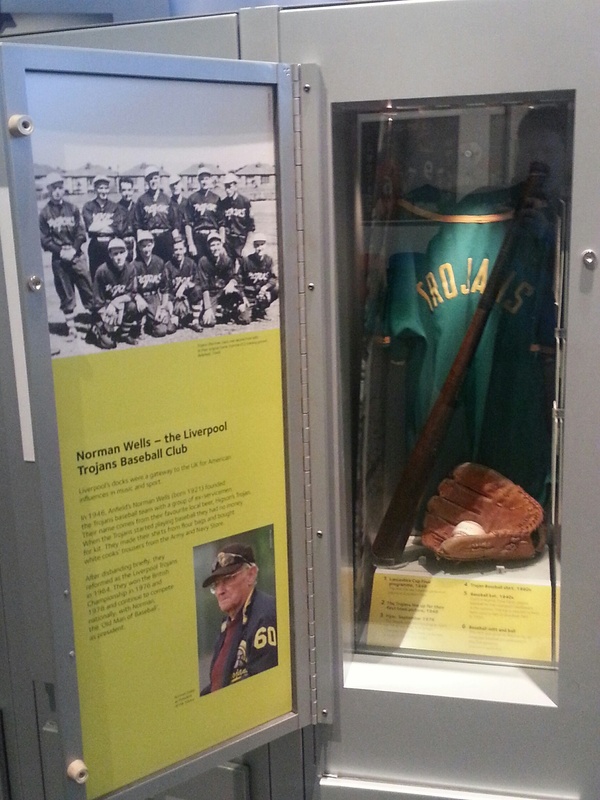 Perhaps most surprising is that the city has a significant baseball heritage stretching back several generations. Many cities seem to hide their sport heritage, or don’t actively represent or promote it, perhaps viewing it as less serious than other cultural markers. However, Liverpool is a perfect example of how sport cultures can be embraced, and exist beside – and even enhance – other heritage attractions. Indeed, having the Liverpool FC bus or the city museum’s popular culture gallery displayed next to Beatles exhibits, or contemporary arts galleries, or a slavery museum simply demonstrates the broad heritage palate of the community. Tourists and locals can be both interested in a Jackson Pollock exhibition AND maritime heritage AND architecture AND sport. Liverpool is a great example how these different topics can co-exist in telling the stories of a community, and other cities should look to their example to see how this can be accomplished. By Gregory Ramshaw in Anfield, baseball, boxing, England, Everton, football, Goodison, heritage, Liverpool, museum, sport, stadium, tourism on August 3, 2015 .